The beauty of independent comics is the passion and expertise of telling an original story that doesn't depend on legacy characters or a predermined outcome. Black Mask studios' 'The Dregs' by Lonnie Nadler, Zac Thompson, Eric Zawadzki, and Dee Cunniffe is an example of the best that indies have to offer. In the conclusion of the miniseries, the creative team demonstrates the ability to create a satifying mystery with an even more horrific underlying real-world message. Our homeless sleuth, Arnold, has in three issues searched all over Vancouver looking for his friend Manny. Along the way, he's had to fight his addiction, contend with delusions, confront discrimination, succumb to gentrification, and all the while battling his status as a second-class citizen. It's been a sobering and gripping look at homelessness under an enthralling mystery where society figuratively and literally cannibalizes the most vulnerable. It all comes to a thoughtful and impactful ending. As in life, not everything has a happy ending. Despite the fight, people like Arnold are merely cogs in one big machine and those with the power to change things often become enablers instead of warriors. Nadler and Thompson have been saving this ending since that first gory sequence in issue one. Here, they pull back the curtain and reveal some chilling realities that hit Arnold like a ton of bricks. Without giving too much away, this machine Arnold was raging against, pounding the pavement looking for answers like his hero Philip Marlowe, was all for naught. When he's led back to the trendy restaurant La Mancha where this story began, Arnold comes face-to-face with the cold hard truth - that progress is inevitable no matter who gets crushed along the way. He's been yelling into the void this whole time. It is an infuriating turn of events, a bittersweet resolution without an actual conclusion for Arnold who fought uphill so valiantly. And worst, no one cares. 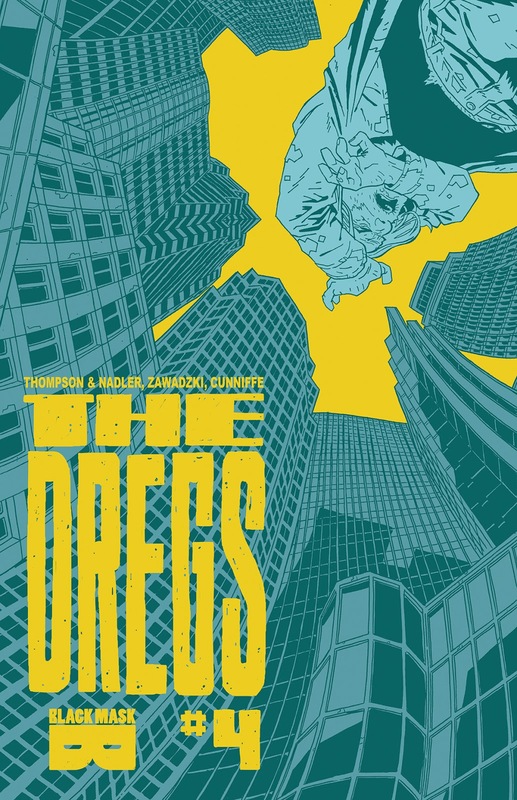 Eric Zawadski and Dee Cunniffe have given 'The Dregs' its soul with every dynamic layout and every gritty panel. Zawadski conveys so much from his designs and not just from a technical aspect. Sure, the lines are clean and perspectives varied to give the story urgency and tension but the art somehow becomes a living breathing thing. The city is at times imposing, looking down on Arnold, mocking his fruitless pursuit of justice. It weaves and changes before Arnold's eyes becoming unrecognizable. The city itself is a character, another obstacle in Arnold's way, another thing that has turned its back on him. Zawadski masterfully captures the emotion and inner turmoil of Arnold with body language and expressions that break your heart. Cunniffe sets the mood, as you'd expect in the crime noir novel that exists in Arnold's head, with dark earth tones and shadowy grays and black. The colors in the restaurant are bold and bright as if someone had turned on the house lights in a darkened theater. It's a moment of cruel clarity. 'The Dregs' is a powerful story steeped in social commentary that seamlessly exists within a compelling mystery. Nadler and Thompson have produced a clever concoction of fear, anxiety, hope, compulsion, sympathy, horror, anger, and ultimately, futility. It has more going on emotionally than ten comics combined. And it all blends to make one of the best comics of the year. A thoughtful and engaging story that stays with you even after the final page.